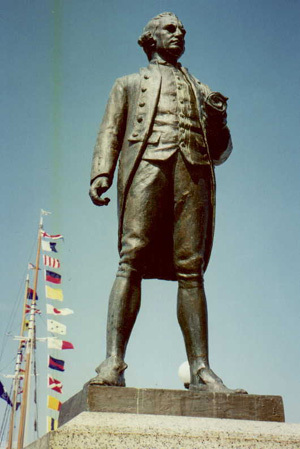 Captain Cook's statue is prominently located at the harbour of Victoria, British Columbia, directly across from the stately Empress Hotel. He faces the hotel with his maps under his arm. The statue reminds me of the one I saw in Kauai. In fact, it looks exactly the same. The setting is much more impressive, however, with the sailboats in the background and the water lapping the dock behind him. It is interesting to note that Cook never ventured into this harbour. His journals indicate that he landed much farther north in Nootka sound, where his crew gathered fresh water, supplies and masts for his ships. He was searching for the fabled Northwest Passage on this particular voyage. He sailed further up the coast until bad weather forced him to turn back and head for the South Pacific islands once again. If you have time, stop into the BC Museum, just across from the Empress Hotel. Up on the museum's third floor among their cultural artifacts, they have the dagger that was used to kill Captain Cook. Or at least that's what the sign says. Fascinating! How on earth did it get there?